After thinking about it for several weeks, I finally decided to make popcorn for supper. Popcorn, as a meal, has a long been one of my family's staples. I remember dad making 2 large roasting pans full of popcorn on Sunday nights. We'd watch Ed Sullivan and Hollywood Palace. Mom would buy a 6 pack of Pepsi and that would be Sunday supper. Down through the years, popcorn has always been a meal preference. With the arrival of air poppers, we could make it without oil, which saved the need to shake the pan to keep the kernels from burning. I haven't done the shake the pan route in a very, very long time, but I'm pretty sure I could still manage, if I wanted popcorn and there wasn't an air popper nearby. I used to buy microwave popcorn, but always found the "butter" contained therein to be a horrible fake, overly greasy and not tasting at all like butter, substance. I finally quit buying it about 10 years ago, long before the concerns over just what was in the stuff surfaced. It does mean I don't eat popcorn at work, but that's okay, really. I pop myself a nice big bowl of corn and add more butter; real butter, not fake butter or, horrors, margarine; than I probably should. Add more salt than I should probably be consuming and it's heaven. But August came and with it that bout of diverticulitis. I heard from friends that popcorn was going to be on the "no eat" list. "The kernels get stuck 'down there'," I was told. This made me sad. 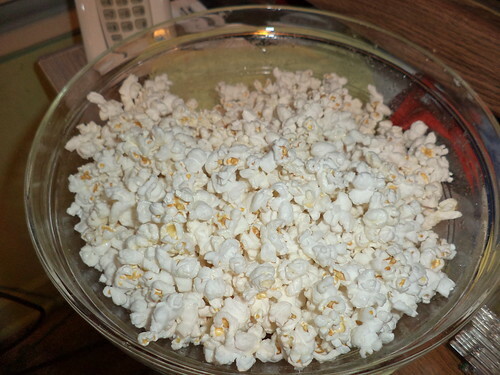 I don't eat popcorn every week, as we used to do, but I will eat it one or two times a month. I used to have a cat who would eat a few bits with me, but these two aren't interested. Mija thinks it smells great but when offered a nice gooey, butter-covered piece, she gives me a look like, "You actually eat this?" I fretted that my meals with popcorn were over. My doctor told me not to worry. "As long as you stay away from the little bits and those ones that aren't completely popped; you know, the ones that sink to the bottom of the bowl; popcorn is fine," he said. Still, I worried. Finally, the lure of popcorn overcame my worry. I know what the symptoms are for diverticulitis. If I start to have the slightest feeling of distress, I'm to contact my doctor right away. I decided to try a big bowl full of popped goodness. So far so good. I did not eat the little bits at the bottom. I would have cleaned the bowl clear but felt I should leave those. Since I don't eat popcorn but once or twice a month, I don't think I have anything to fear unless I would be in the throes of an attack. I never want to go through an attack again and when I was hurting, food was the last thing on my mind. I think, therefore, I can return to having popcorn on Sunday nights. Now, if someone would have a variety show and a bottle of Pepsi, it would be just like it was when I was growing up.